Floriseas, Tortuga, and Journey To… were anchored in peace off Chub Cay in the Bahamas. 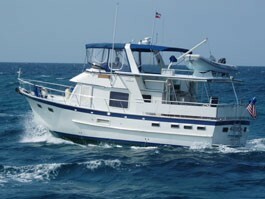 Bob Utter on Floriseas noticed that the exhaust elbow on his Westerbeke 12 kW genset had sprung a leak and was spraying down the engine room with hot saltwater; not a good thing at all. Ray Cope, aboard Tortuga, was actually tied to a mooring at the east end of the island. He was working on his new water maker, which was refusing to deliver feed water to the high-pressure pump. After sharing problems on the radio, we learned that Ray had a spare exhaust elbow that might fit Bob's generator. So, we accompanied Floriseas on the trip around the island to join up with Tortuga. Ray said the spare elbow was left over from his previous boat (16 years previous), and he did not know if it would fit the 12kW model, but the part was free if we could use it. Good news, it fit! The same elbow is used on both the 8kW and 12 kW models. Just as we got the spare elbow installed, Ray's water maker started producing clear, fresh water; probably a miracle awarded to Ray for his foresight to keep all old parts, no matter what, and his generosity to share the parts with a cruiser in need. DeFever Cruisers usually carry spare parts and know-how to share with friends in need in the out islands.